Nominated for Best Writing-Original Screenplay (Wes Anderson, Roman Coppola). “Anderson’s movies often mark out their own weirdly regressive, faintly dysfunctional space, from which the modern world has been politely excluded, and where the occupants communicate in a kind of modified, private language” (The Guardian). 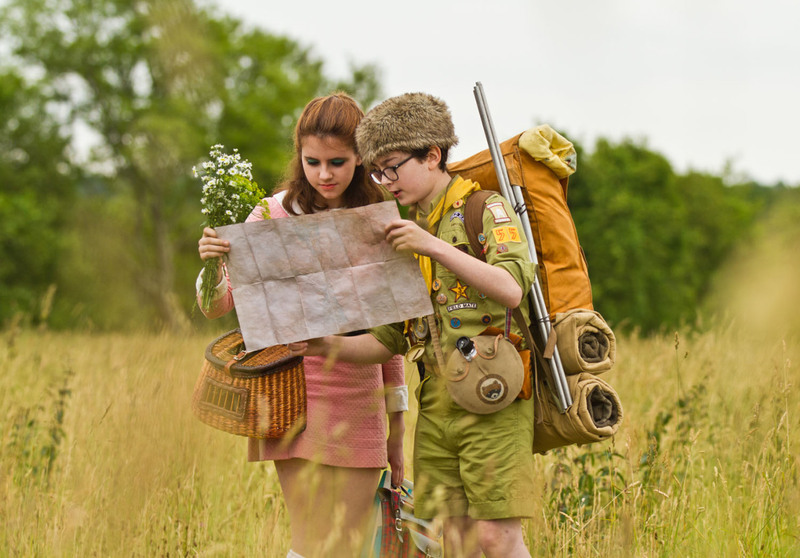 “Moonrise Kingdom” is both bizarrely weird and fabulous at the same time. Wes Anderson is well known for his unique, artistic view of the world and way of telling a story through film. This story of two young lovebirds in a tiny island community with interesting takes on reality is no different. Sam (Jared Gilman) is an orphan who has been with the island’s scout group for some time. An outsider with pyrotechnic tendencies, he meets Suzy (Kara Hayward) at a church play and is immediately smitten. They become pen pals and after much planning decide to “run away” and take a camping trip together. Sam, after all, is an experienced scout. Suzy, on the other hand, seems to know nothing about camping but quite a lot about music composition and interesting library books. The adults are not absent. On the contrary, they are deeply concerned for the well being of their charges. They take a break from their own disfunctions to be preoccupied by the young couple’s and spend a good portion of the movie searching for the two, and then trying to keep them apart. Suzy’s parents, Mr. and Mrs. Bishop (Bill Murray and Frances McDormand) are pretty normal, including the untoward relationship between Mrs. Bishop and Captain Sharp (Bruce Willis). Scout Master Ward (Edward Norton) and his troop are the most unique characters and other-worldly story line of the entire film. As they search for the twelve-year-old love birds and try to bring them back to reality, a storm brews off shore that will turn the small community upside down. Each scene and shot is picturesque. I really enjoyed the cinematography. It was like watching a photograph come to life. The presentation itself was a bit awkward and unique, but that is typical of Anderson’s films. It is all about the emotion and desire. He makes the ordinary seem magical. This film isn’t for everyone. It’s a bit artistic and out there. Its timing is even unique and takes pauses in awkward places. There is a constant reminder that you are watching a film and it won’t allow you to get sucked in. The scenes including the Scout Master and his troop are so out there that the absurdity is comical–in a good way. If you are in the mood for an artistic film in which you suspend a bit of your own reality to watch the absurdity of this 1965 community, then I would definitely recommend this film. If it doesn’t sound like your cup of tea, definitely watch something else.